Kokang MNDAA troops reportedly forcibly conscripting Kawng San villagers in Kutkai township on Oct 21. KLN sources said Lamai Tu (aged 22) and Seng Li (aged 19) of Kawng San village have been taken by MNDAA troops. On Oct 23, 15 Ying Maw villagers have been forcefully conscripted by soldiers from TNLA’s 447 Battalion and MNDAA’s 501st Battalion in Kutkai township. A local source said children as young as 9 have been taken by the soldiers. San Awng (aged 42), Lau Ling (aged 30), Sang Lik (aged 60), Lamung Gam Lai (aged 11), Aik Yi (aged 11), Gwi Ling (aged 60), Hpauda Seng (aged 38), Hpauyam La (aged 35), Ah Nau (aged 9), Lau Mi (aged 55), Aik Seng (aged 38), Li Lau Gai (aged 35), Balawng Lau Ta (aged 35), Gau Wu (aged 30) and Aik Lu (aged 34) were among those taken away by MNDAA and TNLA troops. 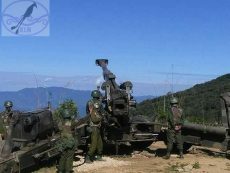 Meanwhile, a series of battles raged between two Shan State Armies (SSPP/SSA and RCSS/SSA) at Loi Hpala hill, located on Mung Yin – Lashio road on Oct 22 and 23.